'AnneBisyosa' debut album by Anne Curtis released! 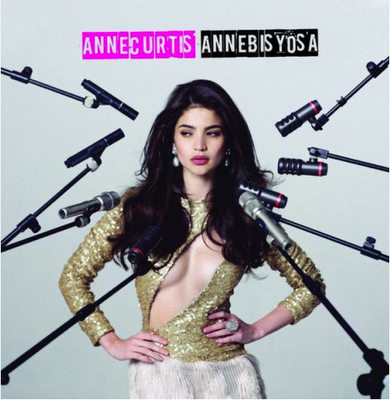 Showtime host, Anne Curtis has just released her debut album entitled "AnneBisyosa". We’re not talking about a photo album. This is a studio album called “AnneBisyosa” featuring the singer who will give all singers a run for their money. Anne Curtis has always fantasized about recording her own album. Now that has become a reality as Viva Artists Agency, Anne’s management, and Viva Records is finally releasing Anne Curtis’ debut album. “AnneBisyosa” will be a realization of one of Anne’s long-time aspirations. Fans of the actress/model will be pleasantly surprised with what Anne has prepared for them. And the casual listener will be as well as “AnneBisyosa” is quite the pop record that reflects Anne’s fresh and bubbly nature. She starts off with an upbeat original called “Tinamaan Ako,” and if there was an OPM pop song for Anne out there – this would be it! Fresh, carefree and not to mention melodious, just like the singer. Keeping up with the up-tempo start is her cover of Cindy Lauper’s “Girls Just Wanna Have Fun,” and a reworking of Cathy Dennis’ mid 90s hit “Too Many Walls,” remixed and arranged here by Anne’s “Showtime” cohort DJ M.O.D. Quite the fan of pop music herself, Anne also chooses to remake New Order’s “Bizarre Love Triangle,” and her edgy pop take on Merril Bainbridge’s “Mouth” to give her listeners a bit more listening flavor.